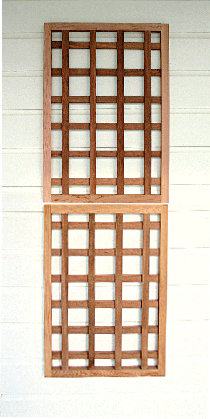 This framed Cambara mahogany trellis utilizes a four inch lattice opening employing heavy 1¼" x ¾" stock and stainless steel fastenings. The trellis provides an excellent modular solution when used in multiples. Each trellis is comprised of two separate pieces that come together in the center to create one complete unit. Additional half sections may be added for greater height.